Amid the myriad changes the GOP Senate and House tax bills are making, one that took some flak is what appears to be a tax cut for those that own private jets. It's a small part of the bill but is one of those meme-friendly things so it got a lot of attention. It was called a tax cut from many reputable news sources, so such a claim gets some credibility beyond just memes. Here are a few reporting this as a "tax cut" or a "deduction:"
However I can't find that article anymore. Instead, The Hill has an article named, "Senate bill clarifies tax law for private jet companies." Which is a pretty big difference. 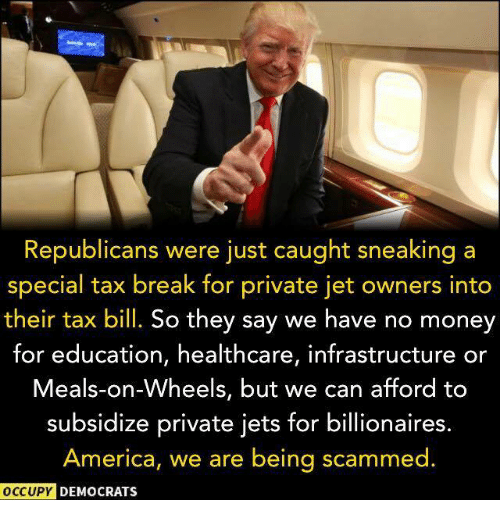 What it certainly isn't is a deduction, as some claim: The GOP is not introducing any language to write off expenses incurred while a private owner maintains a private jet. That's simply not there. According to a 2016 letter from the Joint Committee on Taxation, the difference in federal revenues over the next 10 years (of whether or not the ticket tax applies to these management companies) is about $500,000. That's what there seems to be to it. Calling this a "tax break" or a "tax cut" is misrepresenting what's going on. There has been a 5-year lack of clarity for the IRS and aircraft management companies about whether these taxes are owed, and wasted time & paperwork in both over the uncertainty. It's not clear whether journalists at companies like the Washington Times are being intentionally misleading or made a mistake. But either way, it weakens one's case against a bill when one misrepresents a headline policy as a seemingly-significant billionaire tax cut when it is instead a clerical clarification for a small amount of money. Should Private Jet Owners Pay the Ticket Tax? The other question to walk away with is whether the Senate should have made the decision to apply the ticket tax to private flights, even though that was not the original intent. Private flights consume just as much air traffic control (ATC) attention as commercial flights, but pay far less in taxes to support the ATC system. An argument could be made that taxes on private flights should go up, and that's a conversation worth having. However, misrepresenting the Senate's clarification as a "tax cut" will not help the conversation.